Project Bacon – "On Game Design"
Just an update on cake. I added some new tilesets, so I could set the areas up right for when I get real art. I’ve also added in the rest of the tank enemies from Project Bacon. I’ve also made a few other improvements (MUSIC!) and streamlined some stuff behind the scenes. I put notes in the build about the stuff that’s changed. I did pretty much all I wanted to do with Project Bacon (my little Tank-based combat prototype), so now I’m moving onto the next step. This is a test of more traditional methods of game design (manual placement and setup design principles). I’ve rewritten the engine I’m using to support using manually-created content instead of just random content. 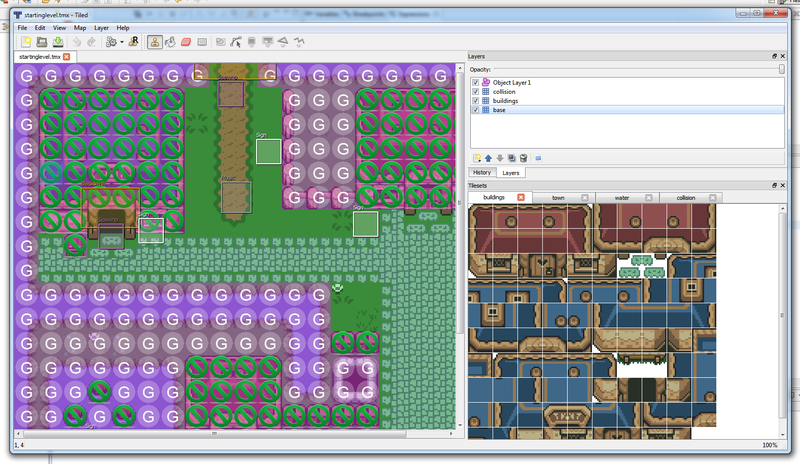 All of these levels are currently set up using Tiled, an open source Tile Editor program. 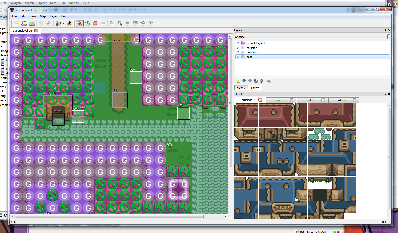 From Tiled I can set up art, gameplay, collision, and much more — it works as a full fledged editor for me. I thought it might be interesting to show a work-in-progress experiment I was doing with the players’ weapons. I’m working first on what I call the “indirect” weapon. The basic idea is that it’s not supposed to be about getting guys right in front of you, but rather you can use it in some unorthodox way to kill enemies that a straight-ahead gun type weapon just won’t do. Space Rangers rejoice! With the final enemy type added in the combat prototype is almost complete. All I need to do now is add in two extra weapons for the player to use. I put in another few hours on the combat prototype and I’ve got a small update that makes a big fun-factor difference. – Enemies now drop little blue orbs. The orbs are worth 15 points each. – The purple gems that are scattered around are worth 30 points each. After adding in the swarmer enemy type (which is a small, easy version of the ranged type that doesn’t block your movement), the game is now a little more interesting. Okay, Space Rangers, I’ve got another update for ya! The biggest change in this version is the addition of the new “Near” enemy type. The final combat prototype will have four types: Far, Near, Swarmer, and Heavy. I finally got a chance to work on the combat prototype for Project Bacon (in addition to a few other nifty little additions). First I’ll describe the extras I put in, and then I’ll go into a little more about the combat prototype. 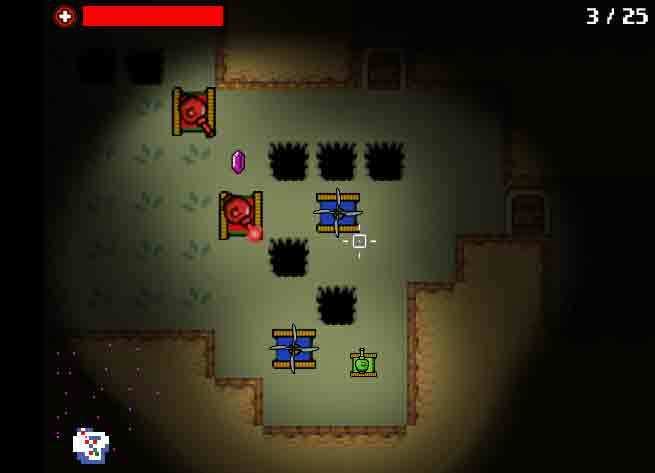 “Fog of War”: The player’s light reveals the map. Similarly, the minimap reveals itself as you play through it, instead of showing up fully revealed. This gives the game an explor-ey feel. It also makes it easier to tell where you have and haven’t been. This time I made a number of behind the scenes changes. I put the lights, the map, and the radar into some nice systems so they’re easy for me to use now. I also improved the radar so that it shows enemy blips. Finally, and most obviously, the enemy will now follow you around the level. This was a huge deal, since I had to go in and fix my duct-taped-together A* implementation and then repurpose it for use in this context. 1) I added darkness and lighting. 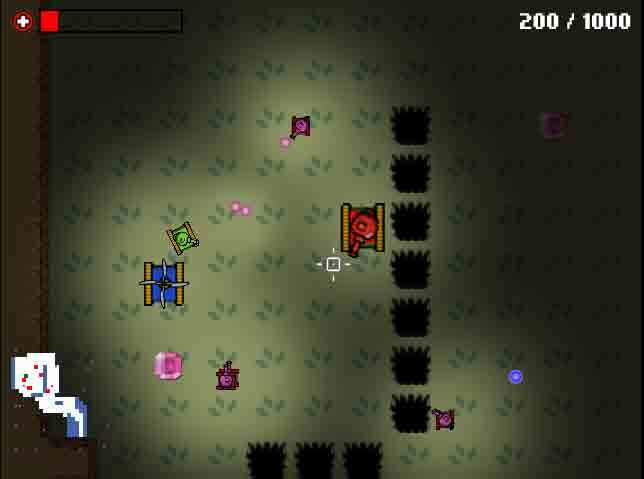 The player carries a light around, and all the bullets you shoot have little lights on them. 2) I added a minimap and a overlay-map. The minimap is up by default. If you hit “SPACE” or “M” it’ll bring up the overlay map. 3) There’s an enemy in the lower right corner of the map. You can shoot him and he’ll take damage (he’s got about 15 HP, each bullet does 1 damage).